This could be another milestone in the history of Indo-US relationship, as the Prime Minister of India, Narendra Modi would likely to visit US in September this year. However, the timing was not yet seems not finalized, according to media reports. 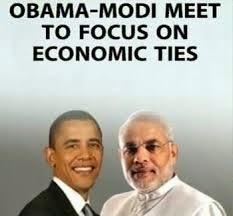 Prime Minister Narendra Modi will meet the President of United States Barak Obama in Washington in September 2014. State Department Deputy Spokesperson Marie Harf told media on Thursday, that they would welcome the Prime Minister of India. Prime Minister Modi has accepted the invitation from Obama to visit US. Inviting Prime Minster of Pakistan for swear-in ceremony, Narendra Modi given clear vision that that India would be looking for more peace and cordial relationship with other countries. This time the visit in September would a advantageous for both US and India and both the countries may talk an various issues including trade, and slowdown. The general elections gave a clear mandate of BJP lead by Naredra Modi and the BJP formed the government with its NDA allies. The impact of stable government was also seen on the stock market, as the Sensex crossed 25,000 mark and Nifty breached 7,000 on Thursday. Experts believe that the stable government at the center may work on foreign policy and improving relationship with other countries.